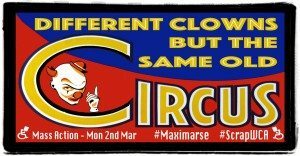 Balham ~ Bournemouth ~ Bradford ~ Brighton ~ Bristol ~ Cardiff ~ Croydon ~ Dundee ~ Ealing ~ Edinburgh ~ Glasgow ~ Gloucester ~ Hull ~ Huddersfield ~ Inverness ~ Ipswich ~ Leeds ~ Leicester ~ Lincoln ~ Manchester ~ Norwich ~ Portsmouth ~ Plymouth ~ Reading ~ Sheffield ~ Stockton-on-Tees ~ Sunderland ~ Toronto ~ Truro ~ Wrexham and Maximus HQ in central London. 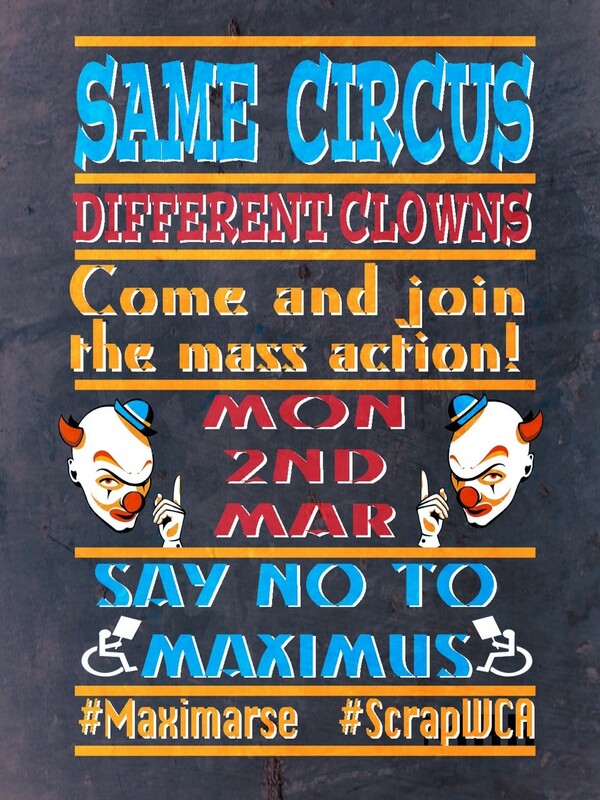 Roll Up!, Roll Up! Roll Up! 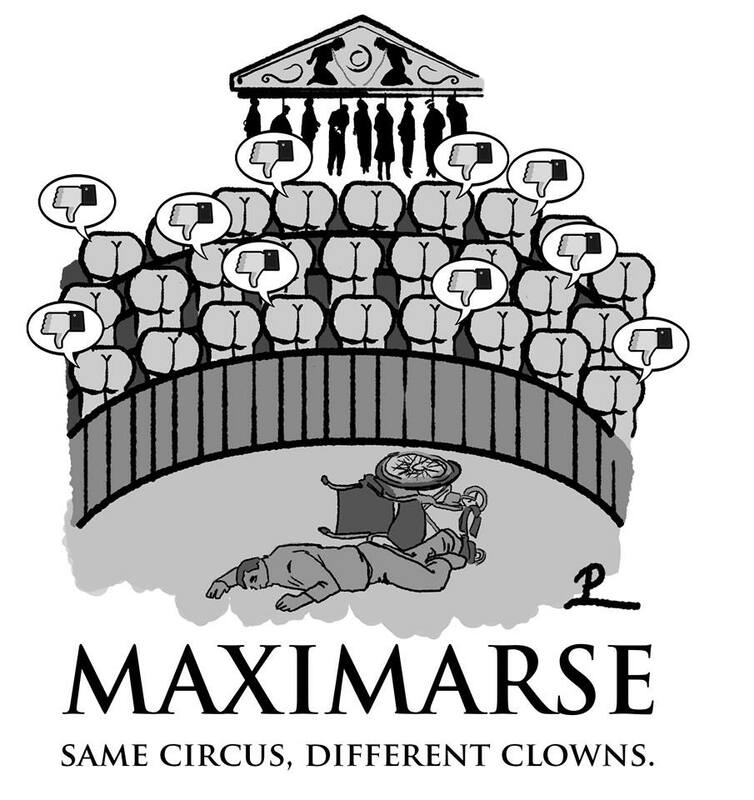 Maximus HQ, 29 Queen Anne’s Gate, London SW1H. 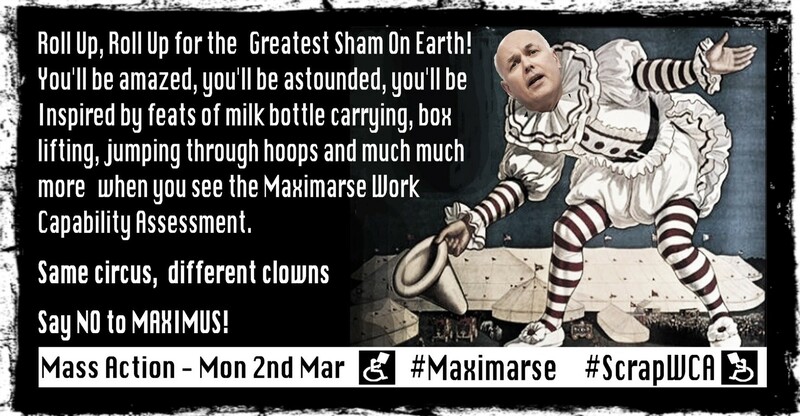 While Atos may have left the ring, the WCA – The Greatest Sham on Earth, continues to amaze, astound and confound all who come across it. This flawed ‘functional assessment’ continues to baffle medical science, ignore centuries of barriers, fly in the face of irrefutable evidence, dismiss the experience of millions of disabled people; and most importantly of all – impoverish hundreds of thousands of people, in the pursuit of ‘reducing welfare’ costs in the name of austerity. So far, almost 4.8 million (yes, you read it correctly) WCA’s have been carried out, with many disabled people forced on to schemes like the Work Programme, where only 26 000 have found any kind of paid employment. 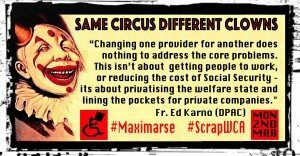 Meanwhile, support streams which actually support disabled people to find and stay in work, such as DLA (Disability Living Allowance) , Access to Work & ILF (Independent Living Fund) continue to be decimated by cuts or abolished altogether. 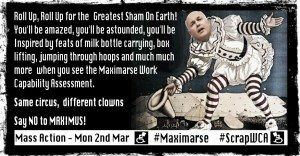 Ringmaster Iain Duncan Smith presides over the farce of a 3 ringed circus of the Department for Work and Pensions, Atos now Maximarse & Work Programme Providers. 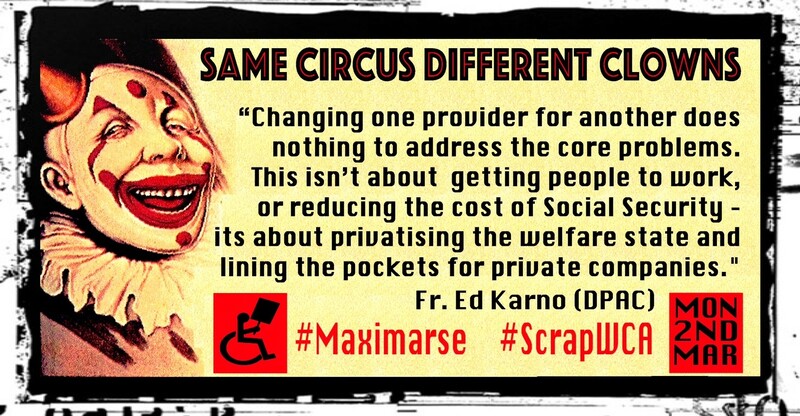 All are making disabled people perform meaningless tricks for the entertainment of politicians and the Daily Mail reading public, and this will continue to wreak havoc in the lives of millions of British people. Countless suicides have been blamed on DWP cuts to benefits, and not just by disabled people, but by coroners, journalists and MPs . The DWP itself is investigating up to 60 deaths, to establish their links to benefit cuts. 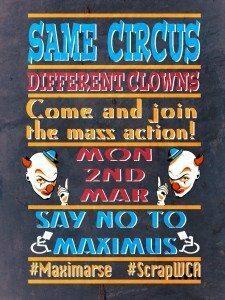 As part of the National Day of Action against Maximus, DPAC says ‘Scrap the WCA – No to Maximus’ and invites you to attend our tongue-in-cheek homage to the ridiculousness that the WCA is. 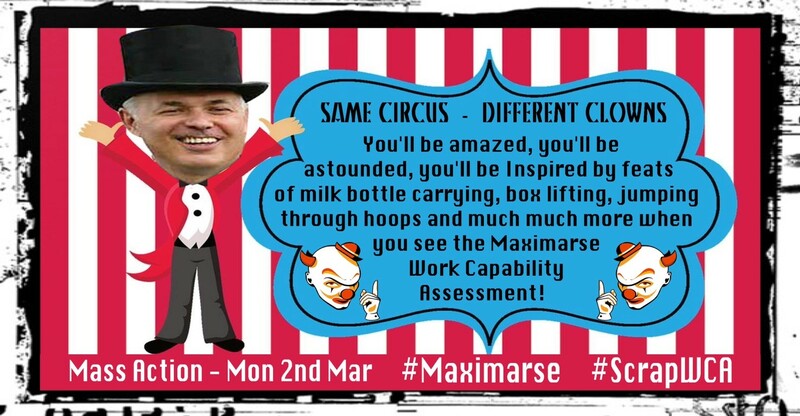 We will hold an inclusive circus event, bring acts and activities to entertain you and get involved in. Alternatively, you can join the 25+ towns and cities across the UK. 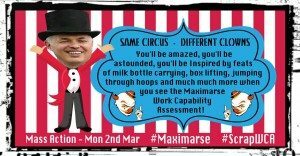 Gasp with awe and be inspired by our glorious & fandabulicious arts and entertainments for your delectation and delight! 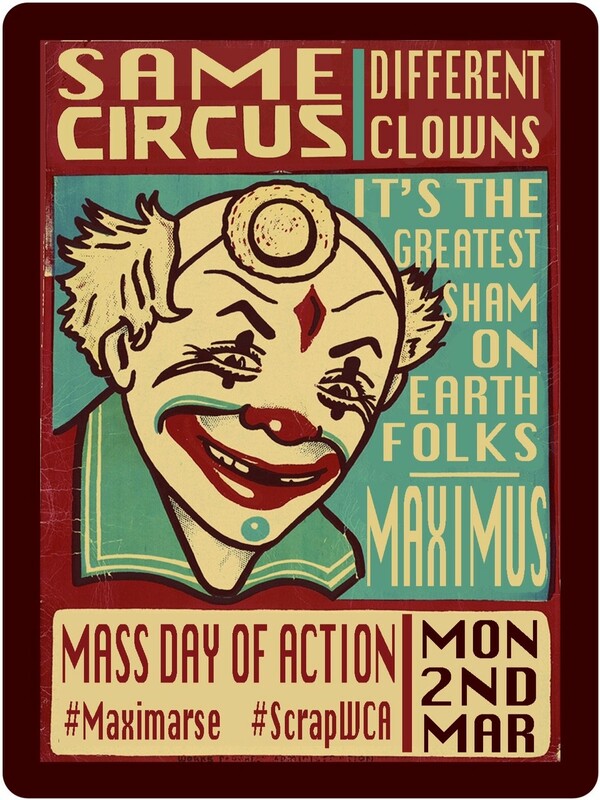 Back from their tour of the great cities of Paris, Berlin, Rome, Madrid, New York, and Los Angeles, we can present to you in all their glory, for one day only, their unforgettable, astounding, awe inspiring, performance of Work Related Activity……. Yes you can believe it, they really are here……………. the DPAC Synchronised Box-Lifting Display Team!!!!!!! 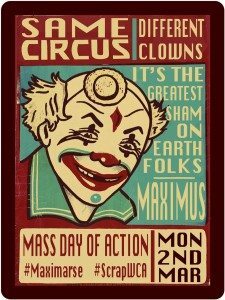 No display of the circus arts would be complete without an act that will set your heart pounding and your bum-cheeks on the very edge of their seat, watch aghast as those zany disabled people attempt a spectacle that you will not believe …….. The MILK CARTON RELAY RACE !!!!! Fed up with having just a face? Ever wanted to look like a tiger ? a clown ? or a wombat ? Block 2, Government Buildings, St Agnes Road, Gabalfa, Cardiff, CF14 4YJ. Medical Assessment Centre, St. Felix House, Silent Street, Ipswich, Suffolk, IP1 1TF. Medical Assessment Centre, 1 Hartshead Square, Sheffield, S1 2FD. i). You can join with Twitter and Facebook, if you have accounts with both, it doesn’t have to be one or the other. ii). Instructions for supporting with tumblr are not given here as this is not generally used. If you have clicked on “support with Facebook” in the screen above, you should now see a screen like this. The centre of the screen shows what will appear when the thunderclap happens at noon on the day of action. This is what will appear on your facebook page (you don’t have to be using facebook at the time, or even logged in, but it won’t matter if you are). Complete the process of Joining the thunderclap on Facebook, click where it says “+ Add My Support” in the box in red at the bottom of the screen. You will then get an acknowledgement message to say that you have joined, and that’s it, you’re done! 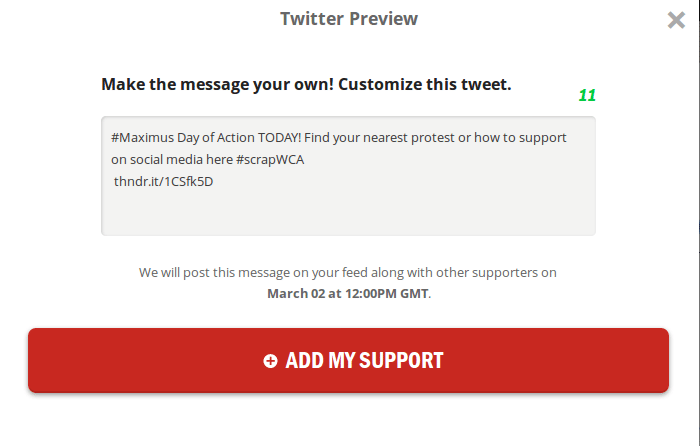 The centre of the screen shows what will appear when the thunderclap happens at noon on the day of action. This is what will appear as a tweet that you have sent (you don’t have to be using twitter at the time, or even logged in, but it won’t matter if you are). To proceed with Joining the thunderclap on Twitter, click where it says “+ Add My Support” in the box in red at the bottom of the screen. You will then see a screen which says “Authorise Thunderclap to use your account” (shown below). Click on the “Authorize app” in blue on the left hand side of the screen. 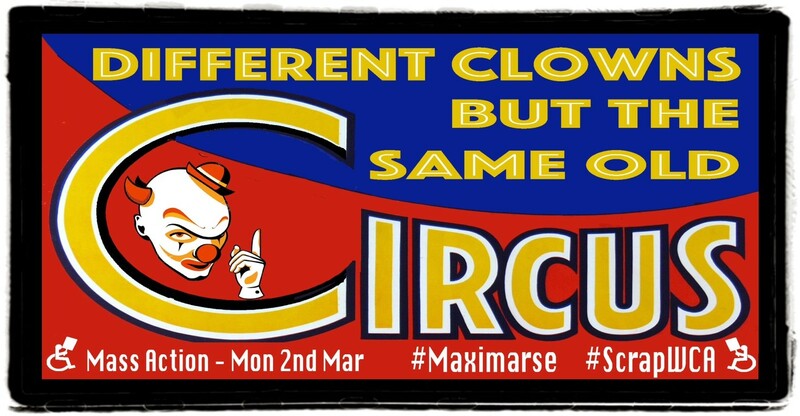 Labour: the First 100 Days #ILVision #SaveILF #Sanctions #ScrapWCA Will claimant refusal to share their sensitive personal data have an impact on their #UC claim?